A CSA—Community Supported Agriculture—program connects you with your food. By buying a share in the winter or early spring, you're reserving weekly pick-ups of sustainably-grown produce right here on our farm, straight from our farmers. Register here for your CSA Share! We plant, grow, and harvest vegetables knowing the faces of the shareholders who will take them home. It's like a weekly vegetable date: from June through October, we get to see you at the same time each week, and you get to watch the farm change through the seasons. This ritual becomes a small, back-to-basics escape that also creates fewer food miles, less waste, and more transparency between you and your food. It represents a commitment to growing and consuming food grown close to home without the use of synthetic chemicals that pollute our soils and waterways. Being a Land's Sake CSA Shareholder feels—and tastes—great! We also partner with local baker Bread Obsession to provide 20-week or 8-week shares of fresh, locally baked bread. Bread Shares can be purchased separately or as an add-on to your CSA Share. Joining our CSA also means that you're joining the Land's Sake community. Membership is a requirement to join the program, and we have different levels to suit every individual or family. In addition to being able to join our CSA, you'll also receive special Membership benefits, including the knowledge that you are supporting the farm. Early Bird Registration: Every December, we offer CSA shareholders from the previous year the opportunity to participate in a special Early Bird Registration period from mid-December to early January. During this time, we offer a 5% discount on your CSA share. We offer four types of vegetable shares, plus the option of adding a Winter Share onto a Small or Full Share at a $35 discount. We also offer a Bread Share. All vegetable shares (excluding the Winter Share) include pick-your-own beans, cherry tomatoes, peas, some herbs, and flowers. Check out this table that will help you decide which type of share is right for you! View more details on each type of share. 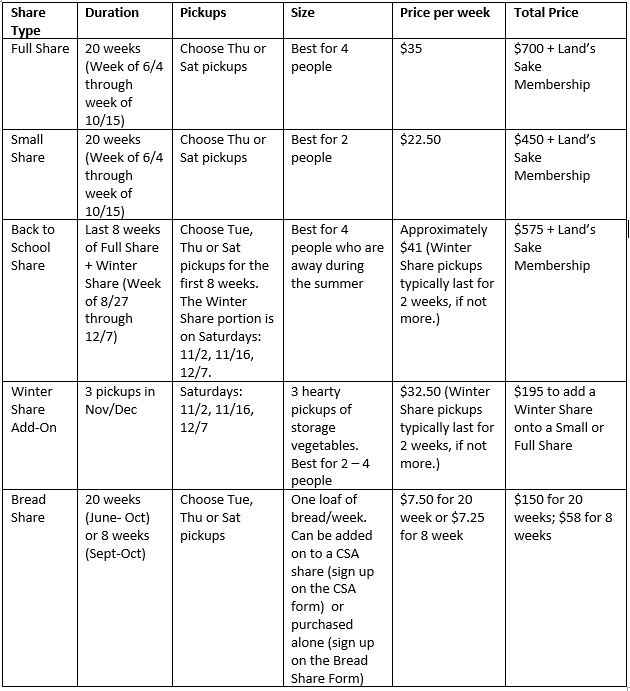 For three more weeks of vegetables, add on a Winter Share (see below) with a $35 discount. As of 4/2/2019, Tuesday Small Shares are SOLD OUT. As of 4/11/2019, Tuesday Full Shares are SOLD OUT. The last eight weeks of our Full Share PLUS our three Winter Shares. Three generous shares of Land's Sake storage vegetables such as winter squash, onions, turnips, beets, carrots, popcorn and more. Pickups are always on Saturdays, 10 am - 2 pm, and are on Nov 2, Nov 16, and Dec 7. Buy a Small Share + Winter Share (total cost $645) or a Full Share + Winter Share (total cost $895) and receive $35 off the Winter Share. As of late January, 2019, the "Winter Share Alone" option is SOLD OUT, but you may still add-on a Winter Share if you are also buying a Small or Full Share. Sign up here for a Small + Winter or a Full + Winter Share. Enjoy a variety of fresh, locally baked bread from Bread Obsession. Types of bread include: Durum Levain, Flaxseed Rye, Lexington Sourdough, Multigrain Sunflower Sourdough, and Tzitzel Rye. You can purchase both a Bread Share and a CSA Share, or you can purchase a Bread Share only. If you purchase both Shares, you'll pick up your Bread Share on the same day you pick up your CSA Share. New this year, you can purchase more than one Bread Share, and you can choose to pickup your extra Bread Share on one of our other CSA pickup days. Land’s Sake Shareholders pick up their vegetables at the CSA tent and/or their bread at the Farmstand at 90 Wellesley Street, Weston, MA each week on their designated pick-up day. Rather than pre-boxed shares, we display our produce and we harvest fresh for each pick-up. 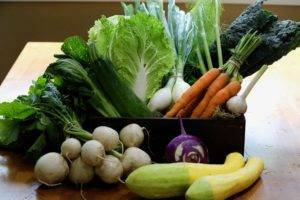 Full and Small CSA Vegetable pick-ups and the 20 week Bread Share pick-ups begin the week of June 4, 2019, and run through the week of October 15. Winter Share pick-ups are on three Saturdays, 10 am - 2 pm: 11/2, 11/16, and 12/7. Back to School Vegetable CSA pick-ups begin the week of August 27 and run through the week of October 15th, and also include the three Winter Share pickups. Back to School Bread Share pick-ups begin the week of August 27 and run through the week of October 15th. Click here to download our 2019 CSA calendar (pdf) which lists all the pickup days. Note: The July 4th holiday falls on a Thursday this year, so, that week, Thursday shareholders will pick up their shares on WEDNESDAY July 3rd instead. Due to the earlier fall sunsets and loss of daylight, starting the week of September 10 and continuing through the week of October 15, the CSA tent will close at 6 pm instead of 7 pm on Tuesdays and Thursdays. Saturdays, Nov 2 & 16, and Dec 7. Please note that the December 7 pick-up will be at Land’s Sake’s Greenhouse at 27 Crescent St, Weston, MA. IMPORTANT NOTE ON DIRECTIONS: The 27 Crescent St address tends to confuse GPS applications, so enter "25 Crescent St" into your GPS instead of “27 Crescent St.” Then, once you are on Crescent St, look for #27. There will be a mailbox and a “Land’s Sake” sign with our logo on it. Turn into the driveway for 27 Crescent St, which is long and narrow (please drive slowly, as it’s only one lane). Follow the driveway through the woods to a parking lot, a Farmhouse, and a Greenhouse. The share pickup is in the Greenhouse. If you are navigating the old-fashioned way, please know that Crescent St is off of Rt. 20/Boston Post Road, on the east side of Weston. After the orientation, you are welcome to stay later and walk around, picnic and enjoy the farm! 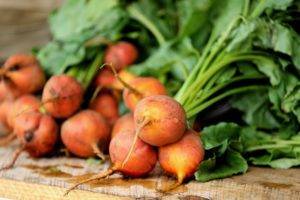 Volunteer your time in exchange for a Community Supported Agriculture (CSA) share! In exchange, you receive a Full CSA Share. Workshares dedicate a portion of their time to the CSA program, working as harvesters, tent monitors, and flower garden weeders and more, and in return they receive their shares free of charge. Check out our Workshare Volunteer Agreement (pdf) for more information, and Contact Hannah with questions.